I remember growing up watching “Full House” and envying the scenes where Bob Saget’s character, Danny Tanner aka “Dad”, would sit next to one of his daughters (whichever one was in trouble at the time) and talk about whatever issue was at hand – be it boys, cheating or lying, or being the subject of idle gossip. Father and daughter would both say their piece, and with the exchange of a warm embrace and “I love you”, all was forgiven and forgotten in the end. Those scenes would break my heart, because more than anything, I longed for that kind of relationship with my own parents. I didn’t need the hugs and kisses, per se. All I wanted was to be able to open up the communication lines. I just wanted to talk with them. But as the child of an immigrant family, that was harder said than done. My siblings and I thought, spoke, wrote, fought and argued in English, whereas my parents did so in their native tongue of Korean. When there was conflict (which there never seemed to be a shortage of), we really only understood the outbursts of anger in our respective languages. Or worse yet, the deafening silence. And none of that got us anywhere except further from one another and deeper in resentment. My sister, brother, and I began to give up trying to communicate with our parents and just figured they’d never understand us. But as we all got older and my parents’ English improved over the years (while our Korean worsened), I think we began to realize how much we all desired to understand each other better but just didn’t know how. The moment we began to communicate - I mean really talk the way Danny Tanner and his daughters did - things started to change. Walls came down, stories were told, apologies exchanged, and wounds began to heal. So when I call or sit down with my parents now, I don’t take for granted that I’m able to express myself and have them understand and the vice versa be true. Not all is understood completely, but we try and make an effort to convey what’s on our minds and our hearts. And sometimes that’s all it takes – it’s just making the effort, knowing that we care enough to do that. And this is why my husband and I proudly support an organization which teaches English to a community of individuals and families longing to make those kinds of connections. The organization is called The Open Door NJNY. It’s located in West New York and Open Door is not only teaching its students the English language but is equipping them with vital life skills as well. The program includes an assembly time after class to discuss pertinent topics, a children’s program, and a computer literacy class. 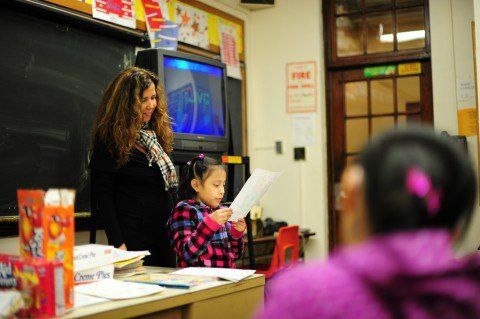 Open Door equips its students to better communicate with their families and within their community. The organization is made up of dedicated volunteers who give their time and talent to help those with fewer resources. I sometimes wonder what life might have been like if such a program had been made available to my parents when they first came to the States. Maybe they would have had an easier time finding jobs and wouldn't have had to struggle as much to make ends meet each month. And maybe we would have had more of those “Danny Tanner/Daughter” moments where we could say what we had to and all was forgiven and forgotten in the end. Speaking the same language isn't a guarantee for better communication, but it sure doesn't hurt. Your compounded inability to communicate was exactly what brought you all into a greater communication. As I was growing up in an English speaking home, the obstacle we had to overcome was 'not knowing how to speak to each other in a deeper way'. My parents came from a generation and families that were inhibited in sharing feelings. My father saw 'feelings' as ridiculous and unnecessary. Considering my parents lived through the Great Depression and WWII, I can understand some of their inhibitions now. They did not know how to open up to their children. How wonderful that you've had this time to really get to know your parents. Sometimes what seems to be an insurmountable barrier can be turned into a great stepping stone. Thanks for sharing, Donna! Growing up, my father was also the very stereotypical stoic and proud Asian male so expressing feelings probably wouldn't have been encouraged even if he did speak better English. But God does amazing things and through some difficult circumstances, He melted my father's heart when I went off to college. That was definitely the turning point of my r-ship with both parents. Now, there's very little that we don't talk about it. I do have to acknowledge that because I was so desperate to communicate and express myself, I started journaling and writing poetry in middle school and it was then that I developed a deep love for writing. So I have to be thankful for that! what an awesome organization!!! i've heard about this before from several people! i haven't been good about keeping up on my social media this summer, but doing my best to catch up :) thinking of you! Thank you for such an intimate memories. Many families are having the same story even now. We can learn languages by the help of internet. We can learn how to behave with our kids or parents with the web help. However, not all the people could do this in the internet, because of various different reasons. In addition, communities like “The Open Door NJNY” can provide more help and feedback to help you learn faster and better. Thank you for pointing it out! People who will read this article could be interested in reading review of MyAssignmentHelp to know what all is about.